Walk Toronto says a new campaign puts too much emphasis on the importance of pedestrians making themselves visible and not enough on motorists driving safely. 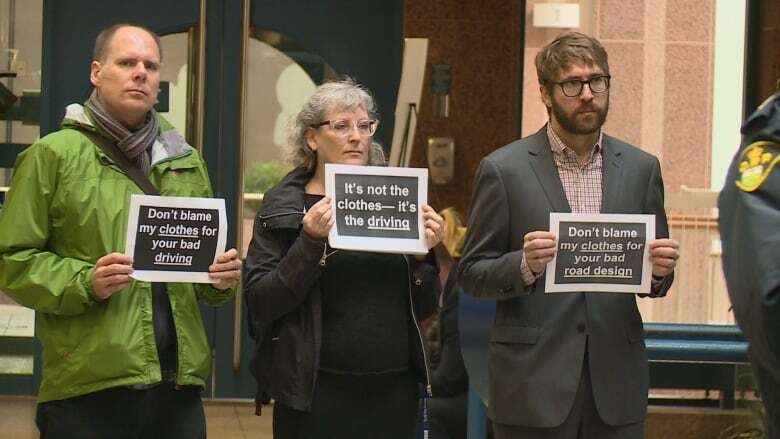 Pedestrian advocacy group Walk Toronto is calling out a new pedestrian safety campaign from Toronto police and the Ministry of Transportation. It says the campaign, called "Be Alert, Be Seen," puts too much emphasis on the importance of pedestrians making themselves visible and not enough on motorists driving safely. "Our concern is that in two-thirds of collisions with pedestrians, the pedestrian has the right of way and it is driver behaviour that's at fault," said Walk Toronto spokesperson Dylan Reid. "It's really important to address drivers as prominently or more prominently." Reid was one of four protesters who carried signs at the campaign launch event on Tuesday. "This year's theme encourages both drivers and pedestrians to pay close attention," Transportation Minister Steven Del Duca said at the event. Dr. Avery Nathens, medical director at the Tory Regional Trauma Centre at Sunnybrook, also spoke. "Compared to last year, I've seen a 21 per cent increase in pedestrian injuries in our trauma centre," he said. Sunnybrook is supporting the campaign. Events held around the province and a short video broadcast online will spread the message: avoid distractions while walking or driving, and be visible while crossing the street. The campaign recommends pedestrians wear reflective clothing or accessories while walking in darkness. "If there's an issue with pedestrian visibility, then we need more lighting at crosswalks," said Reid, who argued that too much focus on pedestrian clothing "shifts blame" away from motorists. The campaign will run through the month of November.